Cubs catcher Miguel Montero called Jake Arrieta a freak. Chicago Manager Joe Maddon said Arrieta was in such good shape that he could record fitness videos, the way Jane Fonda used to. Arrieta can also pitch. He allowed three hits over seven innings, and Starlin Castro had a go-ahead R.B.I. single in the seventh to lead the host Cubs over the St. Louis Cardinals, 2-0, on Wednesday for their first win this season. Backed by just two hits from Chicago’s offense, Arrieta (1-0) struck out seven and walked three. Phil Coke, Neil Ramirez, Pedro Strop and Hector Rondon combined for hitless relief. 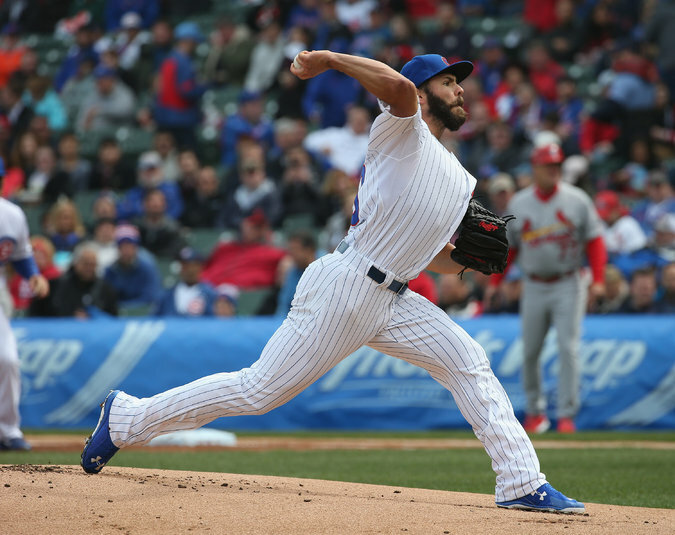 Rondon pitched a perfect ninth for his first save of the season for the Cubs, who lost, 3-0, to St. Louis in Sunday’s opener. Lance Lynn (0-1) struck out nine in six-plus innings, but Castro’s single chased him in the seventh. Montero hit a sacrifice fly off Kevin Siegrist. Anthony Rizzo was hit by a pitch leading off the seventh and advanced after a pickoff throw by Lynn was wide of Matt Adams at first for an error. Castro then singled, ending the Cubs’ 15-inning scoreless streak at the start of the season, and took second on the throw. TIGERS 11, TWINS 0 Anibal Sanchez helped host Detroit blank Minnesota for the second straight game, Jose Iglesias had four hits, and Alex Avila scored four runs for the Tigers. Ian Kinsler drove in four runs for Detroit. Sanchez (1-0) allowed three hits and two walks in six and two-thirds innings while striking out six. Wednesday’s game was his first start since Aug. 8. Ricky Nolasco (0-1) gave up six runs and six hits in three-plus innings, walked four and struck out two. Detroit called up the left-hander Kyle Lobstein after Justin Verlander officially went on the 15-day disabled list. Lobstein will replace Verlander in the starting rotation and is scheduled to pitch Sunday in Cleveland. Verlander, who is out because of a strained right triceps, said he hoped it would be the only start he would have to miss. BRAVES 2, MARLINS 0 A. J. Pierzynski hit a two-run homer, and five pitchers combined on a six-hitter to help Atlanta complete a three-game sweep by beating host Miami. The season-opening sweep was the first for the Braves since 2007. Atlanta outscored Miami, 16-3, in the series. Pierzynski, playing in his first game with the Braves, his newest team, broke a scoreless tie in the seventh inning against Tom Koehler (0-1). Shelby Miller made his first start with the Braves and allowed four hits in five innings. Brandon Cunniff (1-0) followed with one and two-thirds perfect innings for his first major-league victory. PHILLIES 4, RED SOX 2 Jeff Francoeur hit a three-run homer, Aaron Harang took a one-hitter into the seventh inning, and Philadelphia beat Boston at home. Rick Porcello (0-1), making his Red Sox debut after signing an $82.5 million, four-year contract through 2019, allowed three runs and six hits in six innings. Harang (1-0) gave up two hits, walked one and struck out eight in six and a third innings in his first start for the Phillies. Jonathan Papelbon got four outs against Boston, his former team, for his first save. Francoeur homered for the first time in two years for Philadelphia’s first runs this season. RAYS 2, ORIOLES 0 Jake Odorizzi took a two-hitter into the seventh inning, and Tampa Bay coaxed four consecutive walks with two outs to score the go-ahead run during a victory over visiting Baltimore. Odorizzi (1-0) allowed two hits and struck out seven in six and two-thirds innings. Jeff Beliveau, Kevin Jepsen and Brad Boxberger finished the three-hitter as the Rays gave Manager Kevin Cash his first victory and avoided being swept in the opening series at Tropicana Field. Baltimore’s Miguel Gonzalez (0-1) retired the first two batters in the sixth but then walked Evan Longoria and Desmond Jennings.